Our Nappies - Australia's Greenest Nappy and Laundry Service! Easy Washing and Fast Drying – Lavenderia pocket nappies are designed to minimise your work load. Designed with the busy Mum in mind, our nappies are easily washed and dry very quickly. Being a pocket nappy design, you simply remove the inserts and wash both the outer shell and inserts together in your normal wash cycle. You can dry in your dryer or on the line up to temperatures of 40 degrees celcius without worrying about any damage to our nappies. They are built to last! Super soft suede cloth pocket lining is designed to quickly draw moisture away from your baby’s skin to the super absorbent microfibre inserts underneath. 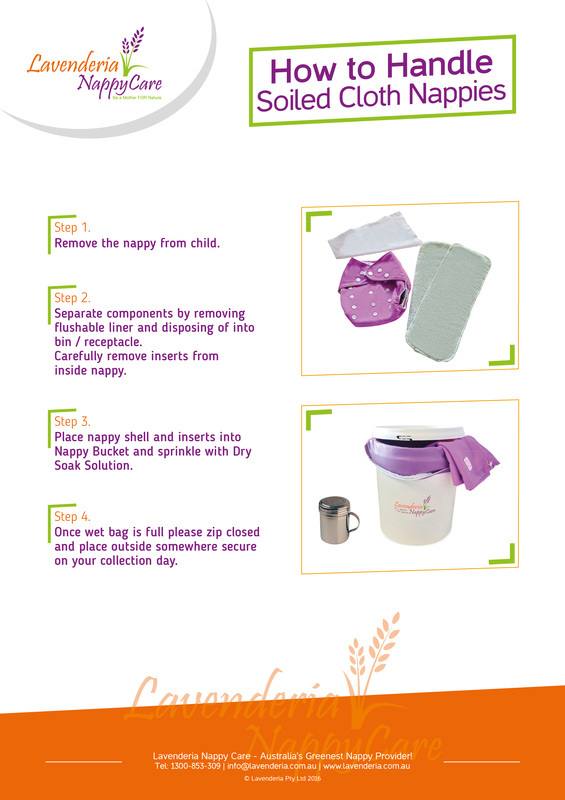 Nappy rash is a thing of the past with this lovely pocket material that ensures your baby stays dry. Our super soft suede cloth stays newer, longer and helps to prevent staining. Firm fitting back elastic ensures a snug fit all the way around the waist for even the smallest child. Anti-Leak Side Gussets have been specially shaped to catch all the mess and contain it INSIDE the nappy - even the odd number three explosions! The elastic casing is soft and won’t chaff your baby's delicate skin. Super absorbent inserts made from highly absorbent, microfibre terry cloth. This fabric is the latest in cutting edge nappy technology and is even used in sports wear and high end fashion underwear. It is more durable, absorbent and super soft and fluffy. After rigorous testing of other fabrics, we found that our 4 layer micro fibre terry inserts absorbed more AND held more fluid longer than other materials tested (including bamboo and hemp). Our microfibre inserts can hold up to 8 times their own weight in liquid meaning less mess for you. Breathable waterproof outer shell is made of the highest quality PUL (Polyurethane Laminate) ensuring your baby’s skin can breathe whilst keeping mess INSIDE the nappy and not on you. Industrial-strength snap fastenings ensure your baby’s wandering hands can not open the nappies. Designed to withstand continual washing and drying, our industrial strength snap fastenings are very durable. Two Different Sizes - Newborns and Full Size We noticed a lot of nappies available today claim to fit newborn and smaller babies but when put to the test did not stand up. Our newborn sized nappies WILL fit your baby from 3.5kgs to 7kgs. Our full sized nappies are for use right up to potty training. Test our sizes – you will love the difference!